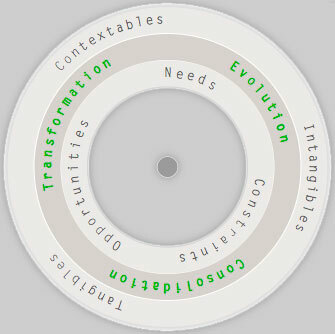 DesignFactors offer a framework for assisting the modeling of design developments and decisions of all kinds. Inspired by proposals for a Unified Modeling Language, UML (+), DesignFactors provide a limited glossary of keywords grouped into five sets of structured relationships. The selection of generic terms to represent core issues helps to bring focus to brainstorming sessions in groups. 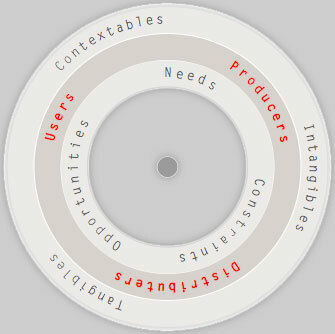 These sets or views cover the relevant phases of design projects. While the first group covers all aspects of research, concept development and evolution, the second addresses factors of a design proposal's development into concrete products or services, including the assessment of its usage. 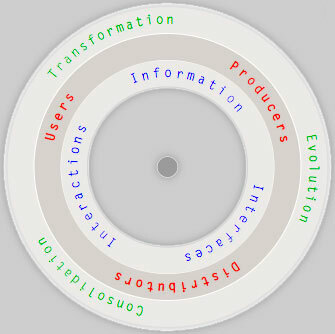 Uncovering valuable knowledge for modification or expansion of the original scenarios, the final view becomes the starting point for the next iteration of a design development's life-cycle. While in many cases users receive more attention because of their clear exposure at the end of market chains, DesignFactors suggests equal recognition of the other two groups. Any artifact conveys certain information through its interface, affording more or less distinct interactions. The developments view represents the integration of all preceding views, an expression of the ensuing increase in complexity. This is also a clear statement that development asks for the involvement of all concerned experts. The application view stipulates appraisal of what has been anticipated in the scenarios of the first view. 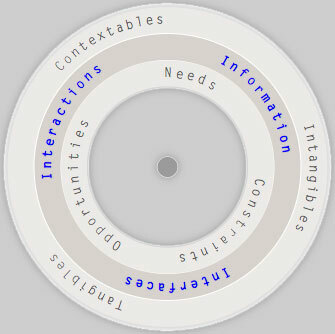 All views share concern for an inner level of contextual factors and an outer level of design classes. Clearly identified needs are often at the origin of very practical solutions, with a high degree of context identification. Opportunities inspire more speculative propositions, where long-term vision may prevail over short-term pragmatism. Constraints, easily perceived as obstacles, are in fact challenges to find adequate solutions. While a tangible product may seem to be the best solution for a certain design task, DesignFactors infer that intangible services or livable environments might be equally considered- as alternative or complementary possibilities. 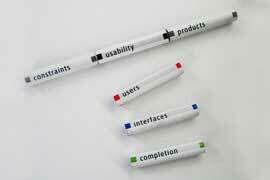 Experiences from various workshop-sessions lead to the development of an alternative diagramming tool. Often, the overview provided by the volvelle-type diagrams seemed to make it difficult to focus on any specific alignment of factors. Mapping the diagram items on a cylinder provides a more linear/exclusive view of each set of combinations. It also allowed to make the order of levels interchangeable, reflecting different directions of reasoning. 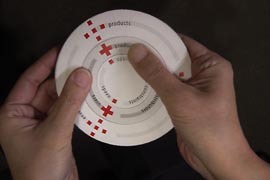 Although DesignFactors have been primarily designed for analog brainstorming, appreciating the benefits of a tangible device, they can also be used for computer-based sessions. Using for example the folder structure of a PC, it is possible to diagrammatically develop complex structures in extremely short time- this approach has the advantage, that various file-types can easily be integrated within the structure, potentially making such diagrams part of larger workflows. 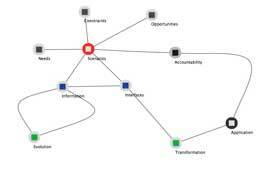 Diagramming software such as OmniGraffle can be useful tools to visualize the result of DesignFactor sessions. + Special thanks to Andreas Kraft (+) for developing the Flash-movies!